Use collaboration to transform your school’s teaching, attainment and performance. Discover why collaboration has become one of the key skills for pupils in the 21st Century, and how beneficial its encouragement can be for your school. Improve student progression through their interaction with other pupils. Develop students’ social skills, emotional maturity, trust, optimism, and autonomy. How pupils are more likely to remember something learned from or with a peer. Collaboration enables students to respond to different learning styles and perspectives. Foster students’ ability to bring and defend their own ideas, and to present their work confidently, and with identity. Develop collaboration as a skill for life; improving the way individuals negotiate with the world around them. 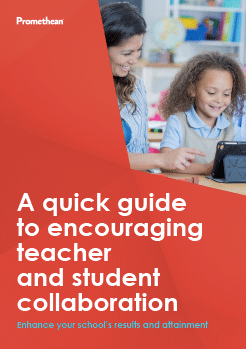 With all this and more, download our FREE guide and put teacher and student collaboration at the forefront of your classroom. © Promethean Limited. All rights reserved.